It took me again a while to post something. So I decided to date this post two weeks earlier. Imagine! Finally we have some sun! After April and May when the only thing you needed was a warm jacket, a scarf and an umbrella now we are running into the Summer. I enjoy the evenings in my sunny and warm flat. I enjoy the views to the mountains and everything else. I really love my flat. And I love the taste of lettuce! I could eat it all day long. 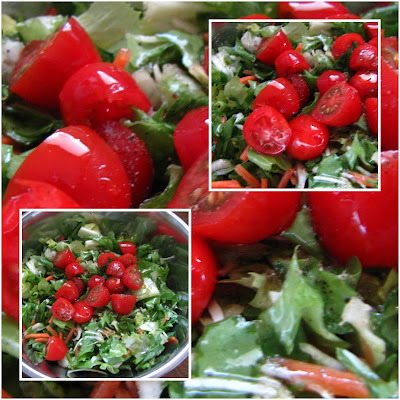 So I made in only 3 minutes an easy dish: lettuce-tomato salad. I added some pepper and Italian white vinegar and olive oil in proportions 2:3 (two portions vinegar and 3 portions olive oil). I took some ciabatta bread and enjoyed the great evening in the sun.